Leaders and managers today are experiencing an “energy crisis”. This energy crisis results from the failure to engage and inspire their people. Yet, a handful of leaders have found an endless supply of energy to fuel their organizations into creating a high-energy culture. They’re the ones who attract the top talent, the most loyal customers, and the public’s imagination. 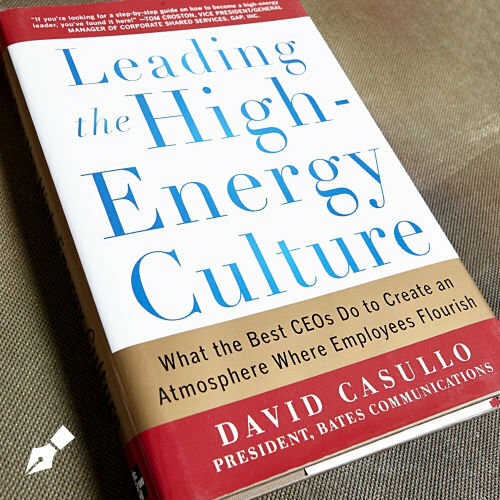 Leading the High-Energy Culture: What the Best CEOs Do to Create an Atmosphere Where Employees Flourish is the handbook to powering this kind of workplace with the energy that your workforce already possesses. A change this big starts at the top. David Casullo, a leadership authority and strategic consultant to businesses large and small, explains the steps for establishing an authentic leadership presence based on your powerful personal truths. Then he shares the secrets for how to proliferate your vision in order to create a sense of purpose throughout your organization and beyond, thereby spreading excitement to consumers, investors, and the media. Using his own experience, research, and demonstrated results from the leadership development program that he developed while helping transform Raymour & Flanigan from a small regional company to a billion-dollar furniture retail giant, Casullo outlines the specific steps that let you discover and unlock the latent energy in your team.